This is a flavorful stew for the slow cooker, perfect for an everyday family meal. 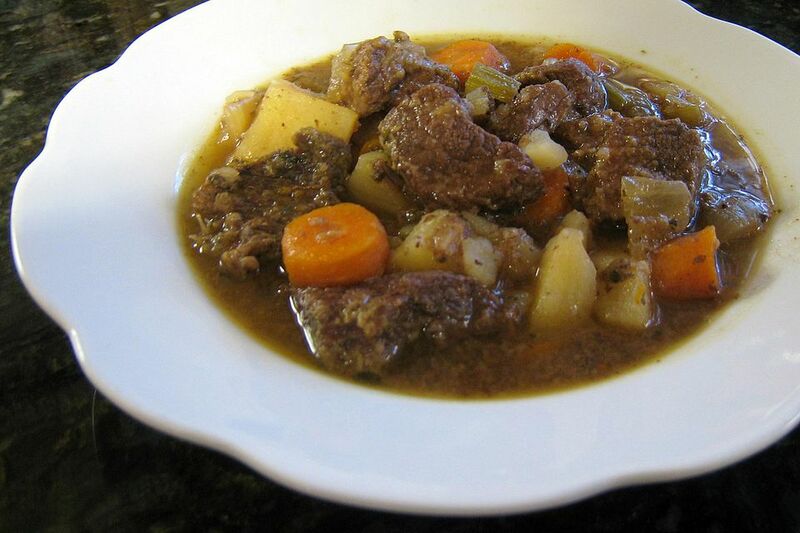 Serve this stew with warm crusty rolls or hot buttered biscuits and a salad. Trim the roast and cut into bite-size pieces. In a food storage bag, combine the flour, paprika, 1/2 teaspoon salt, and 1/8 teaspoon pepper. Add the beef cubes and toss to coat. Add the beef and cook, stirring, for about 4 to 5 minutes, until browned. Put potatoes, carrots, and celery in the slow cooker; top with half of the onions. Sprinkle with remaining 1/2 teaspoon of salt and 1/8 teaspoon pepper. Top with the browned beef then the remaining onions. Combine the condensed soup and beer; pour about 1 cup into the hot pan and scrape up any browned bits. Pour the pan contents and remaining beer and broth mixture over the beef. Cover and cook on LOW heat for 8 to 10 hours, or on HIGH for 4 to 5 hours.